Lock in a great price for Hotel Haverkamp – rated 8.7 by recent guests! Very friendly staff. Hotel was very clean and environment was warm and welcoming. Will definitely stay again and reccomend to friends and family. Staff very friendly, efficient, speak excellent English. The bar has great variety and the bar manager especially makes a visit enjoyable by engaging in conversation as you like. Dinner restaurant particularly the unique menu is always superb. Location to Christmas market. The staff were wonderful, the service impeccable, the food perfectly presented, the beds ideal, and everything was clean and comfortable all in a casual air of relaxed calm. It was extremely hot and there was no air conditioning. We had to sleep with window open and it was noisy. Also very poor wifi kept dropping out. We feel that as the hotel was expensive it should have been better. This is the 2-nd time we spent a week here. Very welcoming reception, the staff are helpful and friendly. The room was big, clean and the beds very comfortable. Very convenient location for shopping or visiting, 5 minutes walk from Columbus Center or the U-boat museum. The hotel has secured parking areas in 3 different location. Staff was VERY friendly & spoke English quite well (better than my German ;-) Good food & great wine. Extra attention (candy-bag) upon leaving. The staff were really amazing and so friendly and helpful. 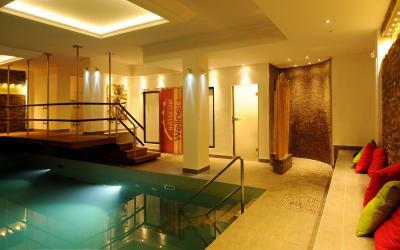 Large and comfortable room, great spa facilities, nice breakfast buffet. 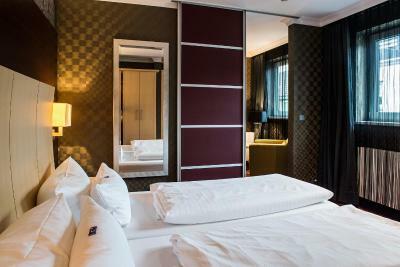 Hotel Haverkamp This rating is a reflection of how the property compares to the industry standard when it comes to price, facilities and services available. It's based on a self-evaluation by the property. Use this rating to help choose your stay! One of our top picks in Bremerhaven.The 4-star-Superior Hotel Haverkamp lies in a quiet side street in the center of Bremerhaven, this hotel offers free Wi-Fi. It also features an excellent gourmet restaurant, sky sports bar as well as free use of the in-house sauna, steam bath and swimming pool. The Climate Science Center, Emigration Center and the Zoo at the Sea are all just a short walk away. 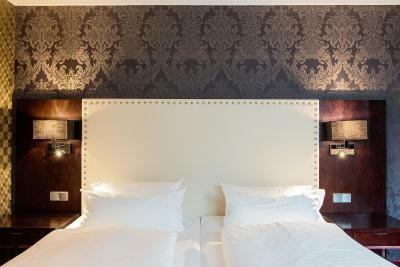 All rooms at the Hotel Haverkamp feature stylish interiors, and a flat-screen TV with satellite channels. A breakfast buffet is available each morning at the Hotel Haverkamp. The WEINROT restaurant is known for its creative cuisine, serving fish dishes, international specialties as well as imaginative vegetarian and vegan cuisine. Guests can enjoy a range of cocktails, beers, whiskeys at our cozy HAVERKAMP's BAR. Guests at the Haverkamp enjoy free coffee 24 hours a day in the lobby. The Hotel Haverkamp is a short walk from sights such as the German maritime museum, the town Zoo and theater, Lloyd shipyard, and the North Sea coast. When would you like to stay at Hotel Haverkamp? Modern room featuring stylish furniture, a flat-screen TV and a private bathroom. Private parking is available on site (reservation is needed) and costs EUR 6.50 per day. This room offers extra space, a seating area and a large bathroom. Some rooms are also fitted with a spa bath. 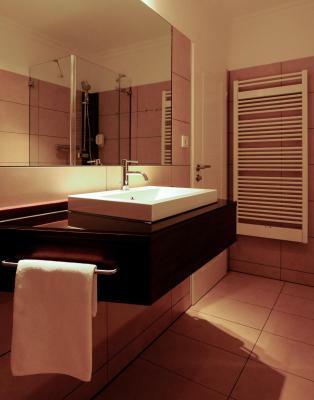 Extra spacious room featuring stylish furniture, a large flat-screen TV, and an elegant bathroom. This apartment features a balcony, kitchen and bathroom. Please note that this apartment is located on the 2nd floor of a building that is 656 feet from the main building, and that there is no elevator. House Rules Hotel Haverkamp takes special requests – add in the next step! Hotel Haverkamp accepts these cards and reserves the right to temporarily hold an amount prior to arrival. Room furniture is dated and overall room is dark. Mattress is very firm and king beds are just 2 twins pushed side by side. We liked everything about the Property. Room was very hot due to excellent weather! Noise, lack of cool air and poor wifi. It is not allowed to use an iron in the room so you have to bring your clothes to the reception and they will do it for you for a fee. There are neither a kettle nor a coffee maker in the room. beds were very firm. a topper could vastly improve things. i was a bit surprised that there were no gym facilities, but my fault for not checking.